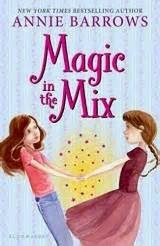 Magic In the Mix, by Annie Barrows (Bloomsbury, Sept 16, 2014, middle grade), was a truly enjoyable book, one I'd have read in a single sitting if my bus ride to work this morning had been 20 minutes longer! It continues the story begun in The Magic Half, in which a girl named Miri travelled back into the past of her old house, and came home again with a twin sister, Molly, from that earlier era. In this book, Miri and Molly travel back in time together....first to the 1920s, when Molly's mother was still a teenager, and then, this time with their older twin brothers, to the time of the Civil War. Each of these time journeys is almost a separate story, though they are connected. The fist is a story of family and belonging, dealing with Molly's situation as a refugee in time--her birth caused her mother's death, and seeing her mother young, beautiful, and alive makes her question whether she has any right to her happy existence far in the future. And Miri can't stand the thought of giving up her sister. The second is more a standard time travel adventure--the two twin boys find themselves prisoners of the Conferderates, and Molly and Miri have to save them. To do so means outwitting a sadistic monster of a Confederate soldier, and it is rather exciting. The journey back to the Civil War broadens the story. It was Good Civil War time travel, too, in a sense of "Civil War such that appeals to Charlotte." Which is to say, not much battlefield activity, but rather two girls observing casual sideline violence, and reacting to it, and saving their brothers from it. I though this part was really well done--nice and tight, with some bouncing between past and present via the old house to add zest. Never before has a Civil War story made me want to read non-fiction about it, until now--Mosby, of Mosby's Rangers fame, sounds fascinating! I find it amusing that one of the twin brothers in the book, previously a reluctant student of history, had exactly the same reaction. And the two strands of story are connected enough that it makes sense that they should be in the same book. It's a stronger book than it's predecessor, I think, and perhaps a more thought-provoking one. There's enough backstory gently provided that it can be read on its own, if necessary. The Magic Half came out ages ago, in 2008; there's definitely room in Miri and Molly's old house for more adventures, which I will happily read if given the chance. -- nice parents who care for their children appropriately. I liked the first book, but didn't have it in my collection for some reason. Ordered both, but the first one hasn't checked out very well. Sigh. As much as I like time travel, my students are not big fans, although the Scarrow Time Riders series is doing okay. Oo, I need to get on with reading The Magic Half -- it's been sitting on my TBR list for kiiiind of a while now. I've just realized that this is the same author who worked on The Guernsey Literary & Potato Peel Pie Society!